Jeeves! Whatever Has Become of My Carriage? The Queen can always find her carriage. Jeeves: Why Sir, I believe it’s stored in the garage, behind your new motorcar. Sir: No, no Jeeves, my own carriage! Jeeves: But Sir, it is your carriage. And quite a handsome one at that. I confess I sometimes miss seeing seeing you in it, pulled by the wonderful team of horses we used to have. Sir: Jeeves, I’m asking about my personal carriage – my bearing, the way I carry myself. What’s become of it? Sir: Amiss! If I were stooped any further forward my nose would be sniffing my navel. Jeeves: Surely Sir it hasn’t come to that. Sir: Perhaps not, but still it’s still quite worrisome. What on earth should I do about it? I spoke with the doctor in the village but he’s of no use at all. Wanted me to start lifting barbells! Can you imagine that? Jeeves: I must confess I cannot Sir. What you need to do is see that Alexander chap in London. I’m sure he can sort you out. He helped Lady Susan with her dowager hump. Sir: Ah, Lady Susan! Now that you mention it Jeeves, she does seem quite fetching these days. Perhaps I should have her over for tea… But to get back to my own carriage, is this Alexander some sort of fancy Harley Street doctor? A carriage doctor as it were? Jeeves: No Sir, he’s not a doctor at all. I believe he’s self taught. An autodidact, as it were. From Australia they say. Sir: Australia! Is he a bloody convict? Sir: Sir Irving! Well well. Perhaps I should go up to London for a consultation. Can you arrange that for me Jeeves? Jeeves: Certainly sir. I’ll attend to it at once. Sir: Thank you Jeeves. Now I must send a note to Lady Susan to arrange a visit. To discuss this Mr. Alexander, of course. 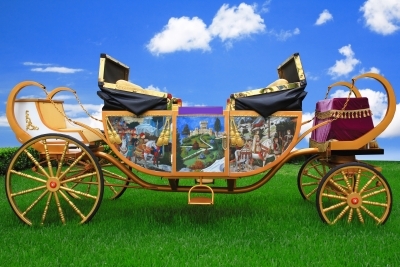 Carriage is a word that has all but disappeared from our language. When cars first came on the scene, the term “horseless carriage” was used for awhile, but that quickly gave way to “automobile” and now “car.” Mercifully, we still have a few baby carriages! Carriage’s other meaning – a synonym for bearing or poise – has largely been forgotten. I think that’s a shame because it very nicely conveys an idea that is at the heart of the Alexander Technique. Alexander tended to use the word “use” (rhymes with loose) to describe how we manage our body as we go through life. It’s a term he got from the language of horse trainers and continues to be used in that field to this day. He never used the word again in his own writing, although in The Universal Constant in Living he included a 1937 Report of the British Medical Association about his work that uses the term “carriage” twice. Curious too how people still accept there are ‘five senses.’ Nobody notices left out was the sense of location of ones own limbs and judgment of relative weight. The word “proprioception” isn’t even in most spell-check dictionaries! What is it about how our own culture has pretty much completely ignored what has become so important to us? It’s no wonder that our students are so often at a complete loss for any words if asked to describe anything they have observed about the way they move. Great post Robert. Very funny. The word “carriage” is very seldom used anymore. Before, having “good carriage” was a sign of “good breeding”. What would be the modern equivalent? I don’t think there is a modern equivalent Victoria. Too bad. I was watching the figure skating at the Olympics last night on TV, and heard a commentator remark on one of the skater’s wonderful carriage! My ears immediately pricked up and wanted to pass that along. I wonder if it is a term still commonly used in figure skating? My guess is that so many people have read the blog that the word is now coming back into use!